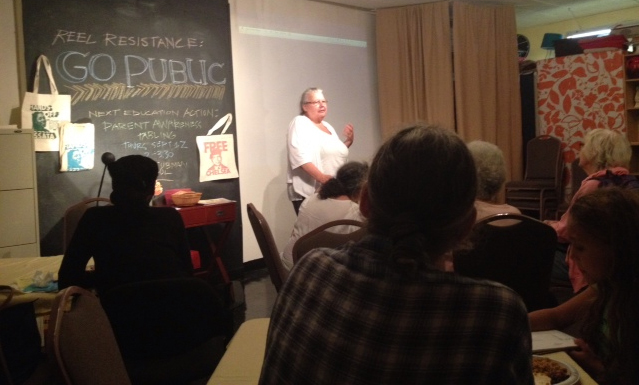 The Reel Resistance Film Series in Harlem recently screened seven of the GO PUBLIC short films followed by a community conversation. Elias Holtz shared this enthusiastic recap of the evening. “Our screening went great! We had a gathering of teachers, parents, Harlem community members, current and former students, and a few children too. The shorts provoked a rich discussion focusing on how teachers and parents are dealing with the continued pressures of budget cuts, testing, and in our neighborhood especially, privatization. Viewers also spoke to the impressive and innovative things that are happening in the public system (as the films show) demonstrating the dedication of people within the public school system. Here are the 7 films chosen to screen.